Whether you want to gain or lose, meal prep is absolutely critical. Now during meal prep Sunday if you’re scrambling around to find containers to store all of that fitfood you just slaved over – we’ve got a problem. I put this guide together because of the lack of information out there on the best meal prep containers. So what is the meal prep process? Break down your macros, how much protein fat and carbs are going in? Find a sweet recipe (this intro prep guide is awesome)– Pinterest, Facebook, or Google it! Get the ingredients and cook! Store it….. wait, what meal prep containers should I get? What makes the best meal prep containers? When thinking how I could help my readers out with research on how to find good meal prep containers, I wanted to first start by breaking down the criteria. Durable – My motto when making a purchase that will see regular use (for these, every week) is buy once cry once. I personally want my meal prep containers to last for a long time and be extremely durable. Leak-proof – This is more or less important depending on if you’re carting your meals all over the place, or more or less just storing them in the fridge all week. If you make messy preps then you’ll want leak-proof containers. Microwave safe – This goes without saying, I know that some people enjoy their meals cold but the bulk of us NORMAL people heat up their food so it needs to be microwave safe. Going a step further they could be oven safe as well to prepare many meals at once. Freezer friendly – Depending on if you do a M-F prep or a M-W prep you may be freezing some of your meals and if you do you’ll want your containers to be freezer friendly. As a simple rule, if they’re leak proof they’re probably freezer friendly – the key here is the seal. COST – Yes cost is important, I know I stated my personal preference on spending for a quality product but that’s not always possible for everyone. 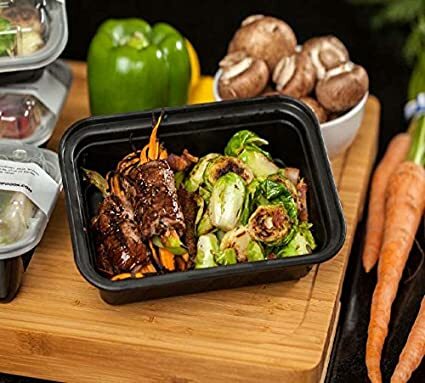 I will certainly present options for budgets of all ranges throughout this guide to finding the best meal prep containers. 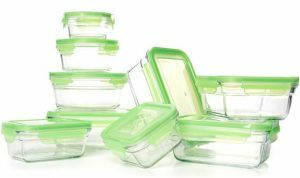 Size – This could often be overlooked but let’s look into the sizes of the containers, use your calorie allowance (if you have one) to decide on which size containers would work well for you. 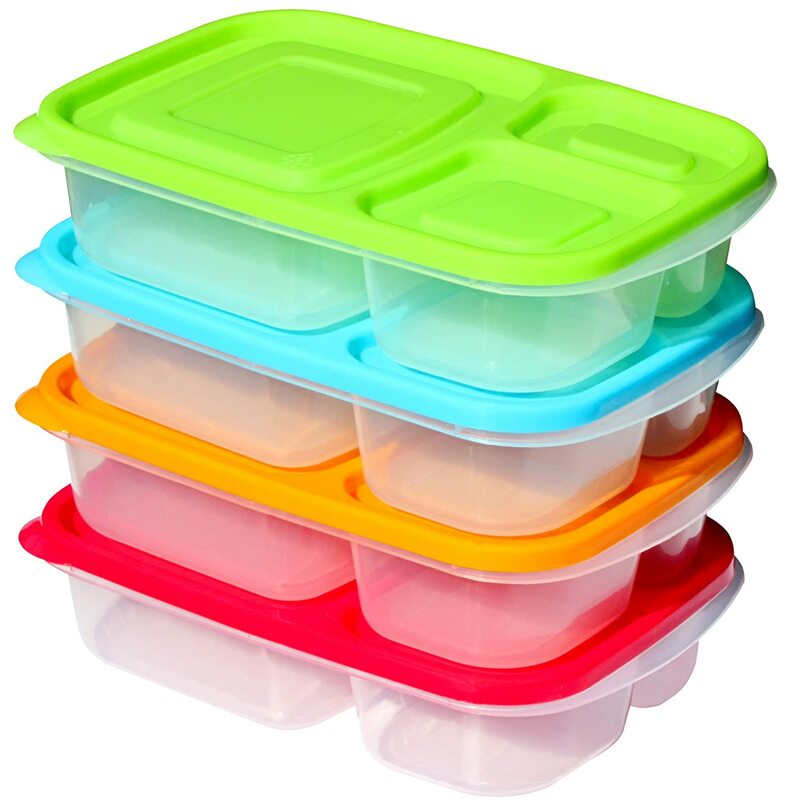 Compartments – Containers are broken up differently, if you do one, two, or three different sides alongside a main portion then you may want to break up the food types separately – buy your containers accordingly. Well with the criteria laid out clearly, let’s get into some of the best meal prep container options out there right now. I’m going to try to hit all of the criteria across a range of budgets, container sizes, compartments, and more. Let’s go! Note: Every container in this list is microwave friendly and BPA free! Two strikes off the list already. Starting off the list is basically the gold standard of simple, budget friendly plastic containers. These come in sets of seven, and have options for 1, 2, or 3 compartments. They’re microwave safe, freezer safe, and BPA free. What I like: I like the price and value, I like that they hold 28oz of food which is a pretty standard size, and I like having different options for the number of compartments. Heat em up, or freeze these and have no worries. They’re also stackable with notches in the bottom which is a nice feature. What I don’t like: I don’t like the durability, and the seal is not the greatest. 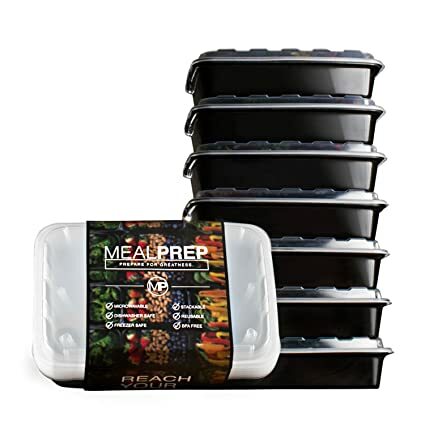 I would recommend these for the meal-prepper with a lot of meals to prepare who wants budget containers. These get the job done, don’t get me wrong, but if I had a bit more to spend I would purchase better sealing and more durable containers. 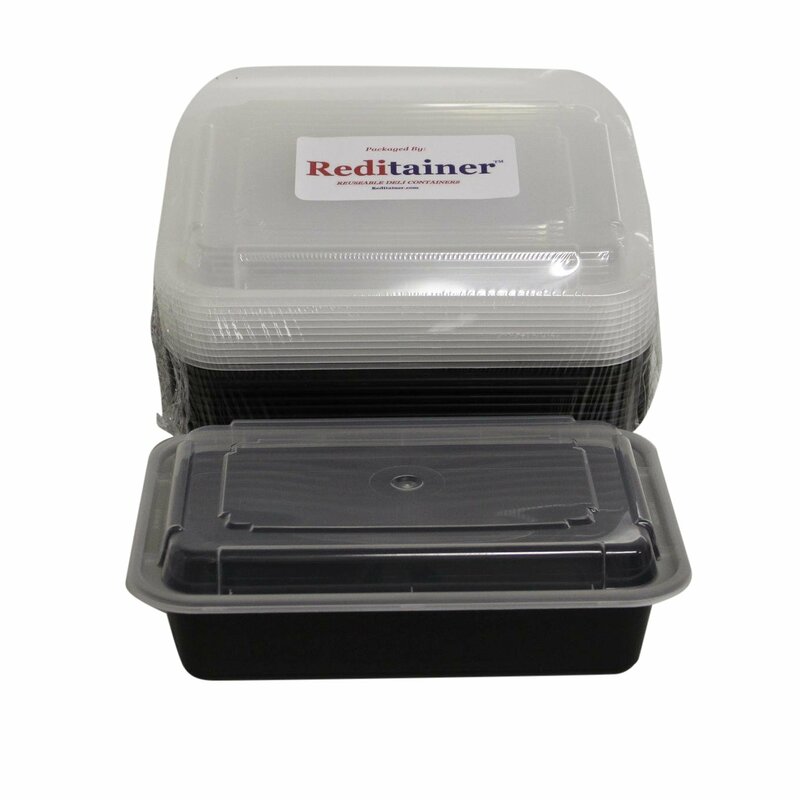 Fitpacker has actually done a good job upgrading from the simplicity of the take-out container with a USA manufactured lid to solve the sealing and leaking problems. I’ll give them props for this, they keep the same simple layout that’s inexpensive but have managed to make a pretty solid container. What I like: They’ve upgraded the lid to be a bit more robust, the price is great, and you get 16 containers in their pack. What I don’t like: They’re still not as durable as a more heavy-duty plastic or glass which we’ll get to on this list. Here’s my next level up when it comes to plastic containers. These aren’t “meal prep” specific containers which I think is a good thing because a lot of retailers have basically used take-out containers and marketed them accordingly. 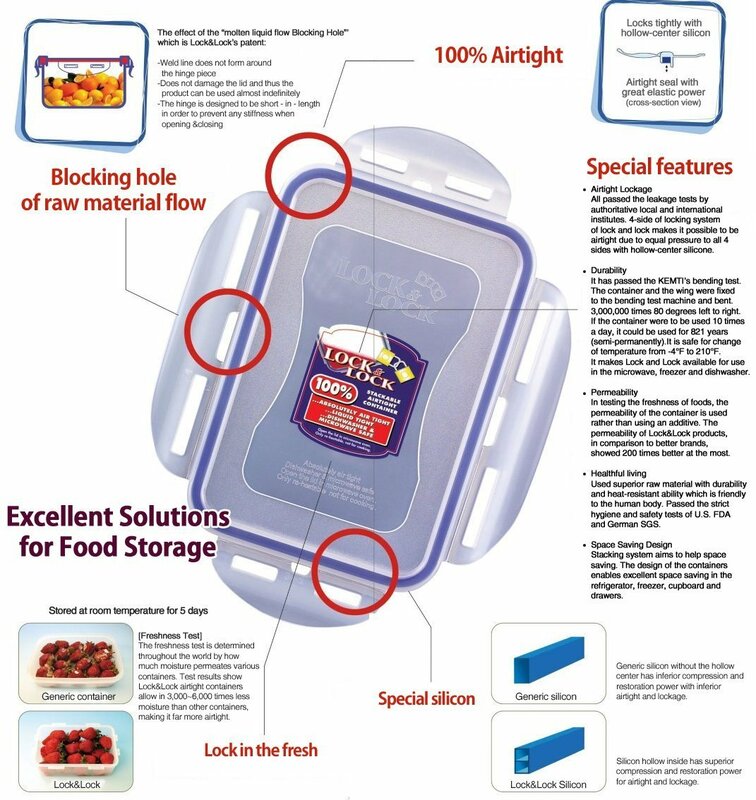 LockLock food storage containers have a great seal, they’re durable, all of that good hot/cold/microwave friendly stuff and they’re not going to break the bank. These are also containers that you could keep for a few years if you take care of them. What I like: The seal is great, you can store soup, slop, stew, anything and it won’t spill or leak. They stay fresher in the freezer and fridge because of the great seal. They also come in a wide variety of sizes for snacks, soups, entire meals, and more. Don’t get stuck with the same rectangular containers over and over. What I don’t like: The purchase packages aren’t great, the best option right now is a 6 pack of rectangular meal-sized containers, unless you want to mix it up with different sizes. I would recommend this set for someone set on a plastic set that won’t break the bank but also will last for a few years. This is a quality product and it’s more expensive than the “Take-out containers” but you’re getting a good deal of durability. These are also the best option if you take your containers all over the place and don’t want to use glass. The first glass container set on the list is the Snapware set. These containers will last as long as you don’t break them, and I prefer glass due to the ease of cleaning. Snapware is a quality name when it comes to food storage and they make some of the best meal prep storage containers. They’re multiple snapping seals are very similar to the LockLock except now we’re working with glass. What I like: They’re glass, they’ll always look great and clean easily. They don’t absorb odors or smells so you won’t taste last weeks tuna casserole. This set is expensive but you’re getting one of the highest quality container sets out there. Glass will never warp so your seal will never change like a plastic to plastic seal can. What I don’t like: If you travel and move a lot with your containers, glass IS more breakable than plastic. The cost is also higher than the plastic containers of course – but you get what you pay for. I would recommend Snapware to anyone looking to purchase a high-end set of meal prep containers that will last a lifetime. They look great, they have some of the best seals in the market, and they keep your food the freshest. Since I’m not a fan of not having all of the same container, I’ve included my favorite glass containers that I have 14 of. They come in a pack of three, and you can definitely find similar packages in different brands but I like the Kinetic set. What I like: High quality, 4x sealed, glass containers available in 12, 22, and 36oz rectangular sizes. These seal great, look great, and you can build a full rectangular set. What I don’t like: The price! That’s all. I recommend these for anyone looking to build an identifiable set of glass rectangular meal prep containers. Most glass sets come with a variety of sizes and if you don’t want those then the Kinetic set is great to check out. The appeal of having all of the same size containers is to keep portions consistent when bulking or cutting for the best results. Getting back to our plastic roots I want to talk about the Paksh novelty sets. I’m including this final plastic set because I think their prices are really reasonable and you get a lot of containers. They also have meal size, and smaller circular snack size containers that are nice if you want to keep your whole set consistent. What I like: They have a better seal than the traditional cheap take-out knock offs. They have compartment variations, and a small snack size container to keep your collection and portions consistent. What I don’t like: They’re only offering a 3 compartment set which isn’t a huge deal, but still the option would be nice. 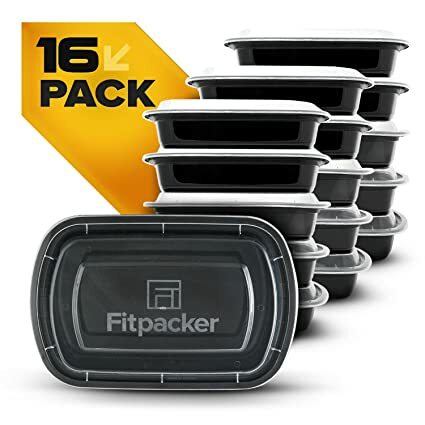 I would recommend this set for someone who wants to keep their entire meal prep container set consistent with meal containers, and snack containers – the value is also great for 10 plastic containers. The meal containers are 32oz and the snack containers are 16oz. What I like: The price, availability, and one compartment style (most of my meal preps are for single compartment). They also have an over-sized 38 ounce container for the best price I’ve found. What I don’t like: The seal, the durability, and the fact that they’re just take-out containers. I recommend these for anyone on a budget. In the end they’re just containers and will work fine for whatever application you have. So we’ve gone through a lot of the top choices out there, and I’ve told you my preferences. It’s time to big a little deeper and break down the criteria a bit more to help you if you’re still not sure. This is probably the biggest decision point when it comes to choosing your meal prep containers so let’s break it down. The plastic containers are of course not oven safe, and the plastic meal prep sets aren’t sized for storing an entire meal. The plastic sets listed here are all identical rectangulr single-person serving sizes, whereas the glass sets contain larger containers where you could store an entire dinner for four people inside of and prepare it in the oven. I just haven’t had a good experience with freezing the plastic containers except for the Fitpacker. 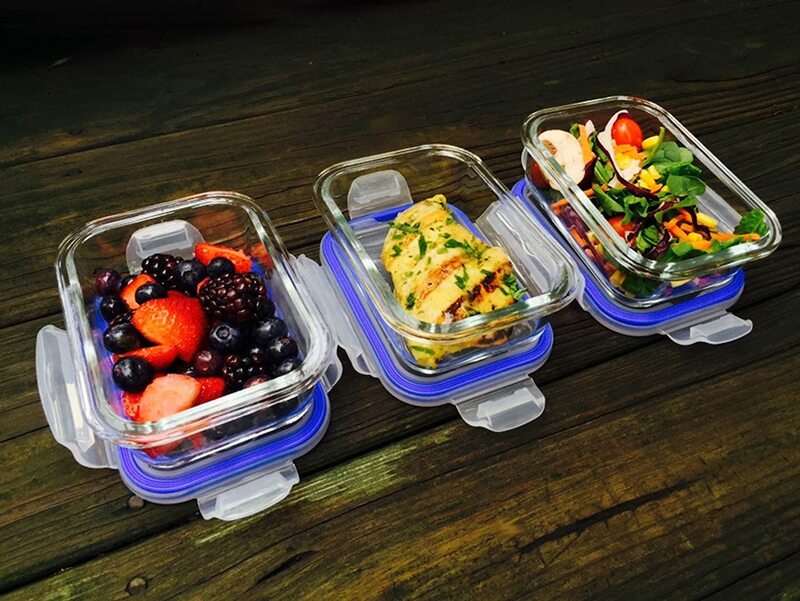 So if you want to freeze your meals get glass or go with Fitpacker. In the freezer the airtight seal’s importance is amplified because your food can be exposed to the harsh temperatures and he flavor can be ruined. Beware! For the standard person, 28-32 oz container size is appropriate. If you’re really eating a lot then there are glass options above 32oz like the Kinetic 36oz, or you could just bring two plastic containers. If you want smaller sizes they do have 10-20oz rectangles as well. Container size is important because without even counting calories you can be close in approximation with serving size, although I always recommend counting calories anyways. Compartments are important to some people more than others – we run into a few scenarios here. Either you prep the meat, veggies, and carbs together and layer it in a single compartment, or you want to split it up. You could buy a few different compartment options within the Meal Prep Brand set so you have a variety, or just deal with either mixing your food up or splitting it up a bit when the time comes. I think a good solution is if you might SOMETIMES want multiple-compartments then when you have a single-component meal all you have to do is split it up between the compartments, no big deal. Then when you want to use the compartments you have them there as well. If you want all rectangular and identical containers then there are glass and plastic options. If you want a set I’ve listed a glass option that includes a few different sizes for family sized meals, larger individual meal preps and even snacks. If you want a multi-size plastic set then I would recommend going with a Rubbermaid set. They have great seals and a variety of sizes available within one set. Buying a specific set will give you all of one type, and buying a multi-set gives you variety. If you mainly want it to prepare individual dinners and lunches then get the same kind. But for family usage I would recommend a variety set. As a bonus I found this really great meal prep container set for kids. The Sunsella Buddy Boxes are colorful, durable, and basically the same as the plastic meal prep containers but kid size! What I like: The portion size is perfect, the plastic is quality, and the seal is pretty good. Microwave+freezer safe. What I don’t like: The price is a bit high or what you’re getting but it serves a specific purpose. I would recommend this for the parent that wants to simplify weekly meal prep for their children’s lunches and dinners. This was a pretty massive collection of reviews and information, a lot longer than I expected. The aim was to educate you on how to pick the best meal prep containers for you – so I hope this helps. If you have a specific type of meal prep container you use, or you want to share your favorite meal prep recipe I’d love to hear about it below! I was wondering, do you know of any company that offers glass or aluminum containers with compartments? I really prefer to keep my food separate but really would rather not buy plastic. I also don’t want to lug around multiple glass containers for multiple meals everyday. From my own research, I don’t think this product is available but I figured I would ask. So any help would be appreciated. Thank you. Hey Stacy! You’re right there aren’t a lot of options, I did however find this glass divided container that might work for you.